World War One is a 120 page graphic novel detailing the history of the Great War. 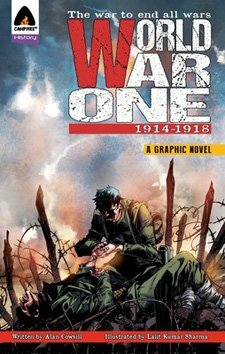 As well as providing an illustrated history covering all the war’s main events, the book tells the story of two brothers caught up in the conflict. It’s by far the most personal project I’ve created as it includes the war exploits of my own relatives: Fred Cowsill, who joined under age and died at the horrific Battle of Hooges in 1915 and Peter Almond who was the only survivor of a gas attack on his trench. Special mention must go to the artist, Lalit Kumar Sharma who created some of the finest comic art I’ve seen for the project. Lalit brought my script to life and not only managed to reflect the violence and horror of the war but also the terrible emotional impact it had on those involved in it. I had the pleasure of working with Lalit on a short companion piece for the BBC detailing the role of the Indian army in WW1. This can still be seen on BBC Radio 4’s website 1914: Day by Day.